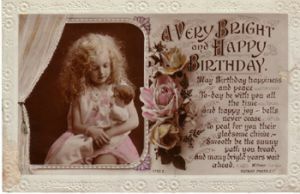 ‘I’ll send you a card!’ a look at postcard history and postcard collecting. ‘I’ll send you a card!’ We all promise that as we go on holiday. Nowadays, postcards from all over the world pour through our letterboxes, bearing brightly-coloured views and exotic foreign stamps. But, even fifty years ago, foreign travel was a novelty, and the majority of British holidaymakers still spent their fortnight’s annual holiday at a British seaside resort. People stayed in boarding-houses or holiday camps, played the penny slot machines on the pier, rode donkeys on the beach and watched Punch and Judy. Tastes were simpler then. shore – but you get the feeling that these deluges have been added afterwards, as people nonchalantly amble along the prom in what must have been a disastrous storm! In the heyday of the great cartoonists, people such as Donald McGill, Douglas Tempest, Reg Maurice and George Studdy were churning out their designs ready to tickle the fancy of the British public with the British, zany, Carry-On type humour. 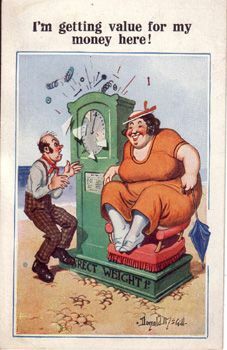 Donald McGill’s cards are probably the most famous today, instantly recognisable to thousands of us by the rosy-cheeked fat ladies bursting from their swimsuits, weedy little hen-pecked men cowering before their women-folk, or battle-axe-type landladies wielding rolling-pins. Colourful and brash, his cards could be found on every revolving rack outside seaside gift shops. she was unsure, thinking it wasn’t quite the done thing for a serious artist. 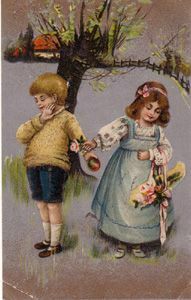 Gentle persuasion worked wonders and soon Mabel was producing postcards for Valentine and Sons of Dundee, with whom she worked for fifty years. 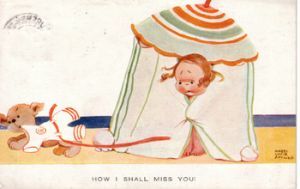 Everyone seemed to love her adorable drawings of pudgy tots which she captioned with adult sentiments, and the range covered practically every occasion. During her lifetime she produced more than a thousand designs. 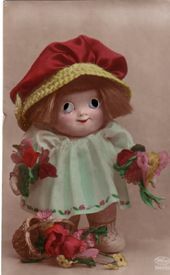 Some of the most colourful and eye-catching postcards can be found filed under ‘silks’ in a postcard dealer’s hoard. There are three main kinds – ‘wovens’, ‘printed’ and ’embroidered’, and it’s this last category which is most plentiful and affordable. The majority of these glorious embroidered postcards date from the first world war, and were sent from the men fighting in France to t heir wives, girlfriends, mothers or sisters back home. Many of these cards are unashamedly sentimental, while others are staunchly patriotic. Some bear regimental crests, while others, perhaps the most poignant of all, depict soldiers, shell bursts and a message which reads ‘Greetings From The Trenches’. 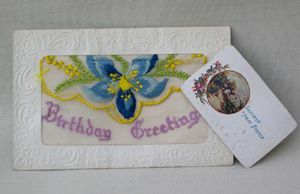 An estimated ten million embroidered cards were produced during the war years. The amazing thing about these vividly-coloured cards is that they were embroidered by hand. Apparently, they were sewn by French women who were pleased to do their bit for the war effort, and at the same time earn some money. The silk embroidery was executed on very fine muslin, which came as a strip approximately six feet long and just under five inches wide, which meant that the same design could be worked along the length about 25 times. When the cards were completed, they were starched to keep the stitches taut, then cut into rectangles and mounted onto a cardboard backing sheet. (These last processes would have been carried out in a factory.) Once mounted, the work measured the standard postcard size of three and a half inches by five and a half. these little cards are still in place, and are printed with a picture or a message. The easiest silks to find today tend to be the sentimental greetings type. Next are the patriotic cards. Regimental emblems are dearest of all – they were less popular during the war, as a soldier would obviously prefer to send his wife a pretty card decorated with flowers and lovebirds, than to send her an image of his badge. Woven silk cards are much rarer. They took longer to produce, requiring special looms and a great deal of skill. 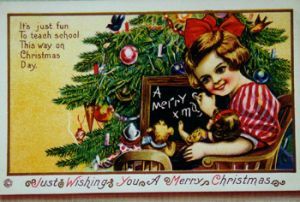 The most famous producer of these cards was T Stevens of Coventry, whose silk cards are so realistic that they resemble photographs. His range was huge, including flags, ships and clasped hands across the sea. 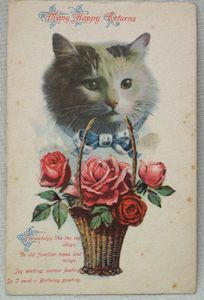 Perhaps the most interesting of postcard categories is the novelty card. Manufacturers vied to see who produce the most unusual. Animals with moving eyes, appliqué cards, cards which show extra features when held to the light, aluminium cards, squeaky cards or those with attached booklets of photos – the inventiveness was amazing. pens weren’t invented till the middle of this century, and otherwise it entailed carrying an, often expensive, fountain pen around. The majority of postcards are cheap to collect and easy to store, which is probably why they are such a popular collectable nowadays.